HEMINGWAY (IRE) (1998). 2 wins at 2, York Acomb S., L. Sire of 188 rnrs, 112 wnrs, inc. SW Status Symbol (VRC Crown Promenade S., L), SP Cuban Girl, Belleza Veloz, Tube and of Let's Go Ernie, Little River Girl, Vaugirard, Windarra Place, Writer, Captanadi, etc. Sire of the dams of 11 wnrs, SP Sirbible and of Profit Share, Robbie's Star, Cuban Lass, Alaskan Wolf, Smart Al, Bite My Dust, Batanguena, Cuban Missile, Kelly's Diva, Wild Oscar, etc. STATUS SYMBOL (f. by Hemingway). 3 wins. See below. Get Stitched (g. by Made of Gold). 3 wins from 1200m to 1600m in Aust. To Do Magic (g. by Niello). Winner at 1450m in Aust. Big Effort (g. by Reward for Effort). Placed at 3 in 2015-16, 2d SAJC Schweppes 3YO H., MRC Grand Hotel Frankston P., SAJC Campolina Stud P.
Prime Status (f. by Primus). Placed in 2015-16 in Aust. Ashkabar. 6 wins to 1550m, A$235,500, AJC Lakemba H., David Jones Corporate Services H., STC Future Children's Hospital H., Todman Lounge H., Christmas Party at the Races H., 2d AJC Latin Knight Welter H., Tantieme H., Padstow H., City Tatt's RC Hat Studio H., STC IEU Your Rights at Work Cup H., De Bortoli Sacred Hill P., WSROC Apprentice P., Young Members P., Subway P., 3d STC Fine and Dandy Welter H., AJC Smeaton Grange H.
Intoxicating Ring. 8 wins to 1400m, A$91,750, SAJC Skycity Adelaide Cup March 13 H., Scott Group of Companies H., 2d SAJC Lucky Horseshoe H., FPD Savills H., Winning Post Sports Bar H., 3d SAJC Chairman's Lunch H., Southcorp Wines 2YO H., Oakbank RC Satab H.
Archalot. 8 wins to 1400m, A$81,650, SAJC SA Hot Water H., 2d SAJC Distinctive Homes H., Become a Member H., 3d SAJC Scott Group of Companies H., Evright.com H.
PRIME ADDRESS (Alzao). 12 wins from 1000m to 2150m, A$481,890, VATC Eclipse S., Gr.3, Werribee Cup, L, VRC Star Sugocasa H., Yearling Sales Welter H., Moonee Valley Functions & Events H., Victoria Amateur Turf Club H., MVRC Bob Hoysted H., SAJC Tattersalls Members H., VATC Smorgon Arc H., Sydeston H., Irish Australian Chamber of Commerce H., 2d VRC Blamey S., Gr.2, SAJC HIH Insurance Classic H., L, John D Lee S., L, VRC Christmas Family Day H., Sirena Tuna H., VATC Hyperno Welter H., Davids H., Pakenham Cup-twice, Yarra Glen Cup, 3d MVRC JRA Cup, L, VATC Barton S., L, Hopetoun H., L, Kilmore Cup, L, VRC Vichealth Championship, VATC Adelaide Casino P.H., Permastall P., Walter Lindrum H., 4th VATC Naturalism S., L, Ballarat Cup, L, Mornington Cup, L, Balaklava Cup, L.
Black Magic (Military Plume). 6 wins to 1400m, A$89,665, AJC Bob Cafe H., Water Company H., Theo Green H., 3d GCTC AAMI Cup, L.
Motown Lady (Al Maher). 4 wins from 1000m to 1650m, A$229,042, BRC Hardy Brothers H., Mittys H., 2d BRC Acadia Landscapes P., QTC Heineken 2YO H., BRC Happy 21 & 50 Zack & Mike Innes H., 3d GCTC Magic Millions 2YO Classic, L, QTC Sea Eagle Electrical 2YO P., BRC Panasonicair.com.au P., MVRC Advanced Mailing Solutions H.
Roedean (Flying Spur). Winner at 2, A$81,950, VRC Werribee Summer 2YO H., 2d MRC Desirable H., Gardenvale H., 3d MRC Blue Diamond Preview (f), Gr.3, Quezette S., L, Lady Wallace H., Storm Queen H., VRC Silver Bowl Series Final, MRC Silvermoor H., 4th MRC Boronia S., L. Producer. 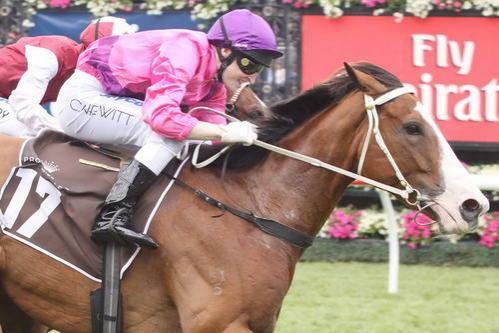 3 wins at 1100m, 1200m, A$268,807, VRC Crown Promenade S., L, MRC Visvanathan Memorial P.H., 2d MRC Betfair H., Derrinstown Stud (Ireland) P., MVRC TEAC Flashback LCD P H., MRC Sportingbet Sprint Series Heat H., 3d MRC Betfair H., Noel Rundle H., MVRC Sportingbet H., 4th MRC How Now S., Gr.3. 2013 foal by Wanted. Dead. 2015 f. by Written Tycoon.